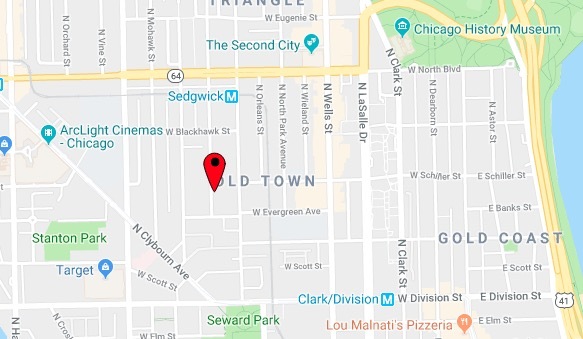 A 22-year-old man who’s on parole for narcotics was shot in the Old Town neighborhood Wednesday morning. No one is in custody. Police responded to calls of a person shot in the 1300 block of North Hudson around 11:50 a.m. Officers found the victim nearby and transported him to Northwestern Memorial Hospital where he was listed in good condition. According to a police department statement, the man was standing on the sidewalk when a gunman approached and fired shots. Shell casings were found in the 400 block of West Evergreen. The gunman, described as a black male who was wearing a gray hoodie and light jeans, fled the area in a four-door silver vehicle that has a sunroof, according to police. The car was last seen heading south on Cleveland. Chicago Police Department records show that the victim has been arrested nine times since 2015 and seven of those arrests took place within a block of the shooting location. His arrests have been for narcotics, trespassing, and gambling, but the outcomes of those cases were not immediately available. According to state records, the victim was paroled in late October after serving part of three concurrent sentences for narcotics.